"I am a mostly stay at home mom of two girls, ages 10 months and three years. I work as a flight instructor about 10 hours per week. 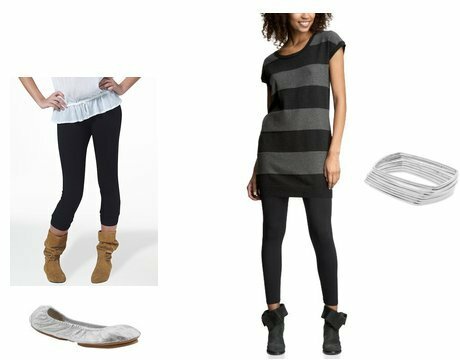 I really like the look of leggings and dresses with boots or sandals but honestly have no clue where to even begin looking! Help me get out of my fashion rut of jeans, tennis shoes and fleece please!" 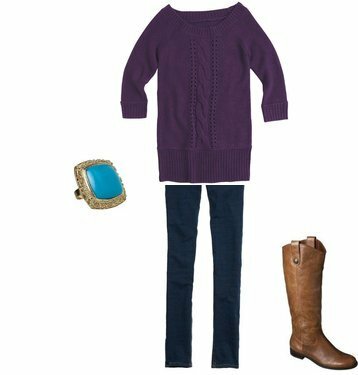 I'm already in fall mode, so I did a lot of looks for Elizabeth that have boots and sweater dresses in them, but I also put together a few looks that would work in warmer weather (and she can always substitute floaty tank tops and sandals for some of these!). I also tried to mainly stick to jeggings - they offer a little more coverage and are just as comfy and easy to wear as leggings. The main thing I think to remember when styling an outfit with leggings or jeggings is proportion! Make sure you pair the skinny pants with a flowy or longer top. You can click on any of the items below to purchase if you like anything shown! LUV-VING those Mossimo boots! I love all the looks you put together! Loving all of the outfits. I bought the Mossimo boots last year and I wore them constantly. They are great for people with big calves because of the stretch. Great with black leggings and I have a short sleeve purple sweater dress. One of my goto outfits. Great picks, Jen!!! They all look fab. Nice choices Jen. I should say the leggings go well with the boots. They all just look great. The looks are flexible for any season.